This is another flashback. This time we have an article from September 21, 2014. This is a basic overview of the ADA. Enjoy reading! Our previous post discussed the history behind the Americans with Disabilities Act (ADA), beginning with the first US patent for a wheelchair, and ending with the passage of the most sweeping disability rights legislation in history. This time, we’d like to take a look at the ADA from a different angle. Just what is the ADA, and what does it mean for individuals with disabilities, particularly those with spinal cord injuries, and wheelchair users? The entire text of the ADA is available online (I’ll put a link below). Because of this we don’t wish to go into extreme detail about every aspect of the act. You can read through it if you wish. Instead, we would just like to take a brief look at what each part of the law means, and explore the topic of public access today. Let’s explore ADA in the spirit of Spinal Cord Injury Awareness Month! There are two central concepts relating to the ADA that are commonly misunderstood. The first misconception is that the ADA is a building code. 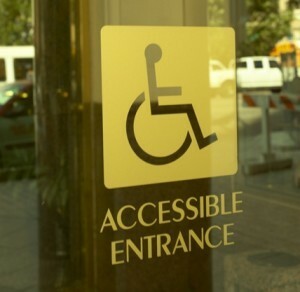 Although there are many implications and precepts that affect both local and state codes, the ADA is more than just a guide to construction practices. It is a civil rights law, modeled after the Civil Rights Act of 1964, and Title V of the Rehabilitation Act of 1973. Because of this a building owner can be taken to court for blatant refusal to comply with ADA. The second misconception is about the rigidity of the law. The ADA is actually quite flexible, and worded to cover many different situations fairly and differently. There are five titles in the ADA, so in order to understand the law completely let’s take a look at each individually. Following each section we will list some examples of how it relates to individuals with spinal cord injuries. This section of the ADA prohibits discrimination against individuals with disabilities in employment, and requires employers to make reasonable accommodations for the known limitations of qualified employees, unless such accommodation would impose undue hardship on the employer. E.g.- Reasonable accommodations for individuals with spinal cord injuries could include making facilities readily accessible, job restructuring, part-time or modified work schedules, reassignment to a vacant position, and acquisition or modification of equipment or devices. This takes the concept of program accessibility from Section 504 of the Rehabilitation Act of 1973 and extends that concept to state and local governments, regardless of whether they receive federal funds. It also insures transportation to individuals with disabilities, while tempering these requirements with limitations that guard against undue burdens on the owners of such services. E.g.- Individuals using wheelchairs may not be denied access to parks or recreational facilities. Requirements that tend to screen out individuals with disabilities, such as requiring a driver’s license as the only acceptable form of identification are also prohibited. In this section public accommodation is defined to mean a private entity that owns, leases, or leases to, or operates a “place of public accommodation”, where the general public has free access. This governs accessibility in commercial facilities, meaning facilities intended for non-residential use whose operations affect commerce, such as warehouses and factories. This section states that a physical barrier need be removed only when its removal is determined by the owner to be readily achievable, that is, accomplished without much difficulty or expense. The most rigorous requirements in this section apply to new construction, and alterations. E.g.- Barrier removal may include installing ramps, making curb cuts at sidewalks and entrances, and widening doorways. This mandates that companies offering telephone services to the general public must offer telephone relay service to individuals who use telecommunication devices for the deaf, T.D.D.s, or similar devices. E.g.- Applies primarily to hearing or speech impaired individuals. This addresses fine points in defining disability and implementation, and offers sources of technical assistance. E.g.- This part of ADA insures that states cannot claim immunity from being sued in relation to the ADA, and also protects individuals who successfully sue a company, government agency, or other entity from retaliation. This is another old piece. This one comes from September 29, 2014, when we were on our previous website. We hope you enjoy. 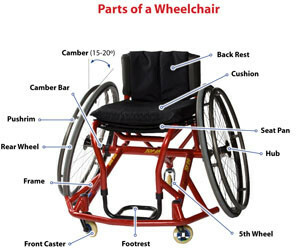 The wheelchair is one of the most common adaptive devices which individuals with spinal cord injuries use. Let’s look back through the years and find out what they looked like throughout history. Confucius and Children by an unknown Chinese artist. 1) The earliest documentation of the existence of a wheelchair is dubious. Some sources say that the first known image of a wheelchair is from the 6th Century B.C.E., and was carved upon a stone on a Chinese sarcophagus. However, we were unable to find clear evidence of this, mostly because we were unable to find a picture, or any back story to this claim. 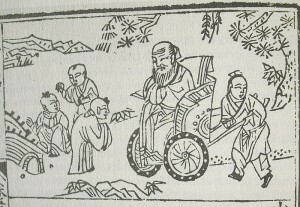 The oldest picture of a wheelchair, to our knowledge is dated to 1680, and depicts Confucius and his disciples, with the wise one being transported on what appears more like a handcart than what we think of as the modern wheelchair. Drawing of King Phillip II and his custom built wheelchair. 2) There are many examples of wheelchairs, usually furniture with wheels attached, being used in almost every location and era since the invention of writing. Often the wheelchair user was not traditionally disabled, but rather employed people to wheel them around because they felt that they were too important or rich to walk. In any case, there are only a few well documented examples of wheelchair use. The earliest, and most known is King Phillip II of Spain (1527-98), and his use of a custom-built chair for when he suffered from gout, a complex form of arthritis, later in life. 3) In 1655, Stephen Farfler, thought to have been either a paraplegic or an amputee, invented what has come to be considered the first self-propelled wheelchair. His device is also considered by some to be a precursor for the modern day tricycle, and the bicycle. 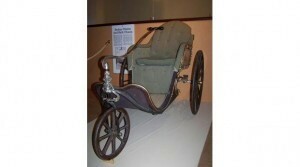 4) Throughout the 18th Century several prototypes and improvements where made in wheelchair design. One of the most popular designs was the Bath wheelchair, invented in Bath and designed to take wealthy individuals to spa waters. 5) More modern designs started to appear after the American Civil War. These included wheels design for individuals to propel themselves, and rely less on assistance for getting around. These led to the first US patent for a wheelchair in 1869. 6) The first folding frame wheelchair was invented in 1932 by Herbert Everest, an injured miner, and Harold Jennings, a mechanical engineer. These individuals eventually formed the company known today as Everest and Jennings. 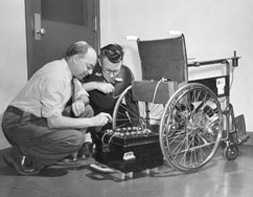 7) In the 1950s Everest and Jennings developed the first powered wheelchairs for mass production. 8) Throughout the 1980s wheelchairs powered by microprocessors were in development, which allowed for far more customizable controls. 9) 1990s- Today: Wheelchair design, maneuverability, suspension, travel distance, and comfort continue to be fine-tuned. 10) Wheelchairs of the Future? We hope you have enjoyed our look at wheelchairs throughout the years. 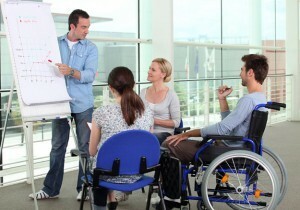 Take a look at this fascinating link to future wheelchair concepts. Here is another older post from our previous website. We still find old articles that we have yet to transfer over, so we will continue trying to collect all of our content on this newer website. This post was from November 26, 2014. Thanks for reading! In a continued look at adaptive sports equipment and the exciting opportunities that exist in adaptive sports, we would like to discuss one of the newest full contact adaptive sports. Since the creation of wheelchair rugby in 1977, there have been few creations in adaptive sports that have taken off. Yet, in 2009, Ryan Baker and Bill Lundstrom decided to adapt the sport of lacrosse. It’s been taking off ever since. According to an article from New Mobility in September of this year, Baker and Lundstrom were not new to adaptive sports when they decided to adapt lacrosse, but neither of them had played lacrosse prior to their injuries. However, with some research, and determination, they have been able to tap into the a growing base of individuals interested in the sport, holding clinics to teach the sport in various locations, including San Diego, Denver, Atlanta, Tampa, Richmond, Baltimore, and New York City. According to New Mobility, Baker and Lundstrum hope to eventually see wheelchair lacrosse become a Paralympic event. Until then, the sport keeps growing, and changing, along with the rules. Let’s take a look at the sport through the lens of the official rule book, available at wheelchairlacrosse.com. First of all, there are several pieces of equipment necessary to play wheelchair lacrosse. The crosse, or lacrosse stick, is composed of wood, laminated wood, or synthetic material. The rules provided specifications for the length of the stick, as well as the pocket size. The ball used is an indoor no-bounce lacrosse ball made of solid rubber. Because lacrosse is a full contact sport, padding is required for all players. The rule book calls for a helmet, mouthpiece, gloves and shoulder pads. All players may wear knee pads to protect from any checking by the opponent, but this is not required. In addition, the goalie must wear a chest protector, shin guards, and a throat protector. A protective athletic support cup is also encouraged. Wheelchair lacrosse, usually played on a roller hockey rink, requires eight players per team to be on the field at all times. There are two attackmen, whose job it is to score goals. This generally restricts their play to the offensive end of the field, and also requires them to demonstrate good stick work with both hands, as well as quick mobility and skills to maneuver around the goals. There are three midfielders, who cover the entire field, playing both offense and defense. They also must demonstrate good stick work, including throwing, catching, and scooping. They’re main job is to clear the ball from defense to offense. Also, two defensemen, responsible for defending the goal, must be able to react quickly in game situations. Finally the goalkeeper leads the defense by reading the situation and directing the defensemen to react. Because of this, they need to have good hand eye coordination, and a strong voice. Quickness, agility, confidence, and ability to concentrate are also essential. Besides making goals by throwing the ball past the goalie into the net, the players are allowed to make often brotal contact with competitors by swing lacrosse sticks, poke checking, and slamming into one another in order to force possession of the ball. While doing all of this, players must be coordinated enough to handle their crosse, while maneuvering their chairs at the same time. 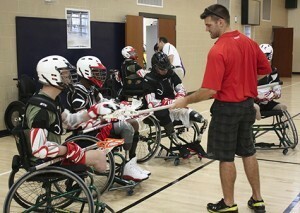 If you are interested in seeing the athletes in action, please visit the Wheelchair Lacrosse website. There are many videos from the clinics that have been held across the country. Lacrosse is a very exciting sport to watch, but for those who are interested, it often more fun to participate in sports than to be on the sidelines. For more information about participating in wheelchair lacrosse, in addition to more general information about the sport, please visit the wheelchair lacrosse website, or visit New Mobility.com. Also, please see the links posted below. Hope you enjoyed learning about this up and coming sport, and we look forward to more sports articles in the near future. This is another old post from our previous website. We will begin posting new content on a regular basis starting this week. However, since we wanted to share some older material today. Enjoy! The month of October is very exciting this year! That is because we have begun the preliminary wheelchair basketball games leading up the main event, our 3rd Annual Abilities Tip-Off on Nov. 16th. On Oct. 5th we gathered at Wilkes University for our first preliminary event, and on Oct. 19th we will be holding our next event at Misericordia University. We will also be holding prelims on Nov. 1 at Lackawanna College, and on Nov. 15 at the University of Scranton. One of our goals for this webpage has always been to celebrate every individual’s abilities. There is so much that can be done if each of us focuses on our abilities even in a small way. By doing this we can build up positive attitudes and become better each day. Sometimes there are obstacles that must be overcome in order to participate in activities in a healthy way. It is one goal of our group is to make the general public aware of obstacles which individuals who have spinal cord injuries, or use wheelchairs, may face. In this way, our Annual Abilities Tip-Off brings a fun event to the public and allows us to spread awareness in our community, celebrating what we can do. In this post, I would like to begin our focus on ways in which adaptive sports equipment has helped open new doors for individuals with disAbilities. The majority of adaptive sports came into existence after WWII, when returning injured veterans began looking for ways to participate in more activities. 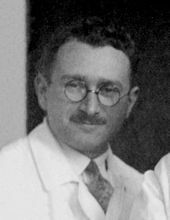 However, one of the most popular adaptive sports, wheelchair basketball, can trace its roots to 1944, and the work of Ludwig Guttmann. Guttman was a Jewish doctor who fled Nazi Germany, for Britain, just before the start of WWII. He was a neurosurgeon by trade, but in 1944, because of experience that he had with spinal cord injuries, the British government asked him to establish the National Spinal Cord Injuries Center at Stoke Mandeville Hospital in Buckinghamshire. A major part of Dr. Guttmann’s philosophy was that sport was a major therapy method for those veterans returning from the war. Not only did sports help these individuals build up physical strength, but also, they were able to maintain self-respect. Though Dr. Guttmann’s adaptations for basketball were a little different from how the sport is played today, it is important to note his influence on the American version of the game. In addition, Dr. Guttmann was the first organizer of the Stoke Mandeville Games, which was held on the same day as the start of the 1948 Summer Olympics in London. These games continued every year after, and are now known as the Paralympic Games. So what about the equipment for basketball? Well, even though this was one of the earliest games adapted, it was played using regular wheelchairs for quite awhile. Usually, a sport must be rather popular before specialized equipment is created for it, and it wasn’t until the 1980’s that wheelchair basketball athletes, alongside wheelchair manufacturers, began developing lightweight chairs that are quick, durable, and can turn on the spot. Now they come with many additional fixtures, and are made with sets of three of four wheels. The fourth annual Roll on Capitol Hill (ROCH) and Advocacy Conference was held this year from June 7th to June 10th, and for the second year in a row members of the I AM group attended. Recently, I had a chance to speak with Holly Petro, and Mike Pellicano about their experience in Washington, D.C. The ROCH is an event sponsored by United Spinal with the goal of addressing issues and policies that impact the health, independence, and quality of life of individuals living with spinal cord injuries or disorders. It took on special importance this year, with the celebration of the 25th Anniversary of the ADA. This four day event calls upon attendees to advocate for the issues that are most currently developing on Capitol Hill. Each day of the event had something new in store. While the first day was set aside for arrivals, followed by a welcome reception, the next three days were full of action. Holly and Mike, along with members of their families and other attendees, spent Monday in a classroom-like setting where they learned about bills currently in legislation and about how to advocate successfully for these issues. In groups based on state districts, some of the issues that were covered included separate recognition for complex rehab technology under Medicare, the Congressional Bipartisan Disabilities Caucus, the Safe Streets Act of 2015, and access to safe and effective biologic and biosimilar medicines. On Tuesday, primed with their new advocacy training, Holly and Mike participated in three Capitol Hill Meetings each. They were each paired with another person from their district, or at least from PA, and left to visit offices throughout D.C. Essentially, the goal was to meet with Congressional representatives, or in many cases their staff, and to inform them of the importance of each of the bills or topics on the agenda. The hope is that the advocates make an impression on the representatives so that they will offer their support for the bills in legislation. This can be a challenging thing to accomplish. Holly Petro with Paul Bowers and Bryan McCormick, Pittsburgh. For Mike Pellicano, the ROCH took his passion for advocacy to a new level. Mike is someone who is interested in many of these issues in Pennsylvania, but being in Capitol Hill allowed him to explore these issues on a national level. Also, Mike was able to meet other advocates who are just as passionate. One such man spent several years rallying for state-funded grants for spinal cord research in Minnesota. “It was great to meet so many interesting people, all with different levels of injuries, and from places all over the United States,” said Mike. 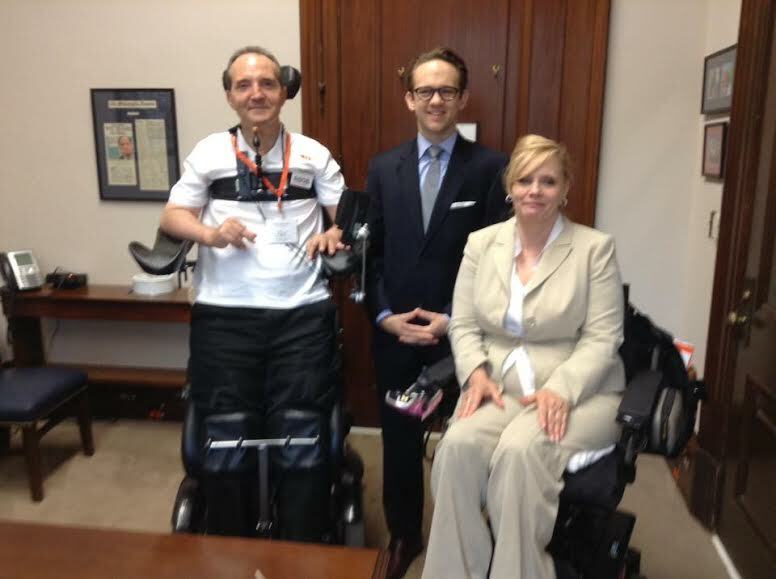 Meeting with Senator Toomey’s Staff Member Brad Grantz along with Madonna Long, fellow advocate for United Spinal Assn. — with Michael Pellicano. When all was said and done, Tuesday was all about the representative’s views on the various issues. “You should know where they stand,” said Mike. In talking with Holly and Mike they assured me that most of the staff they met with were very nice. “I was a little surprised and disappointed that we only got to meet with staffers, and not representatives, but overall it was a good experience,” said Holly. Later on Tuesday, a Congressional Awards Reception was held in order to honor one Senator and two House Representatives. Rep. Tammy Duckworth (IL) received the 2015 Disability Rights Champion Award for her role in expanding the rights of veterans, veterans with disabilities, and the broader disability community. Rep. Rob Wittman (VA) received the 2015 Vets First Congressional Bronze Star Award for his efforts to increase opportunities for veterans living with disabilities and to help them reintegrate into their communities. And, finally, Senator Patty Murray (WA) was presented with the 2015 Outstanding Congressional Leadership Award for her extensive leadership and vocal support of disability issues. United Spinal also honored consumer advocate Willis Washington who received the 2015 Advocate of the Year Award for his years of effective advocacy on behalf of people with disabilities, not only in his own state of Oklahoma, but across the country. Overall, the 2015 Roll on Capitol Hill was a successful gathering. Both Holly, and Mike say that they would love to go again. I’d like to thank Mike and Holly for chatting with me about the event. In addition, I thought it would be nice to post a link to some of the bills that were being discussed. Feel free to click the links below, and read up on the issues that are up legislation. At each link there is a list of sponsors of the bill, so you can check and see if your local representatives have added their names yet. As Mike said, “It’s important to know where they stand.” Lastly, we would like to encourage you to do more research on these and other issues. It is always good to be informed, and to know what your representatives are doing for you. September is National Spinal Cord Injury Awareness Month, and throughout the month we would like to take a look at the history of disabilities awareness, and public access in the US. It is easy to focus on the Americans with Disabilities Act (ADA) as the defining moment in the history of disabilities rights. This is because the act is such a radical change from previous government policy, and provides the written presentation of basic civil rights that have not always been provided to individuals with disabilities. Like the well known civil rights movement of the 1960’s, the Disabilities Rights Movement was a long arduous process marked by many shameful moments in US history. Yet, there were also many heroes, those who pushed for equal rights and lobbied for advancements in the treatment of individuals with disabilities. Some of these people have been forgotten throughout history, but we would like to celebrate them. In future posts this month we will look at the ADA and its impact on the US today, but it is important to first take a look back into the history that led to the passing of the ADA. The first significant date in our discussion is Feb 16th, 1869 when A.P. Blunt, and J.S. 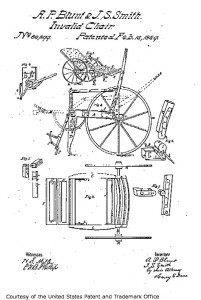 Smith registered the first US patent of what we now call the wheelchair. As you can see from the image here, their terminology is a clear mark of the attitude held toward disabilities in the time that they lived in. Yet, the invention of such a chair was a great leap forward for individuals with physical disabilities. 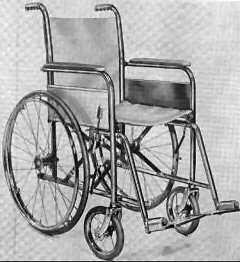 Later, in 1909, the first folding wheelchairs began to be introduced for people with mobility disabilities. Additionally, in 1937, Herbert A. Everest, and Harry C. Jennings patented a design for a folding wheelchair with an x-frame which could be packed into a car trunk. These innovations in wheelchair design, along with the eventual development of the electric wheelchair allowed individuals with spinal cord injuries, and others, to have more mobility in their lives. In 1933, Franklin Delano Roosevelt became the first seriously physically disabled person to be elected as President of the United States. It was during his first term in office that The League of the Physically Handicapped was formed in New York City. The purpose of this organization was to protest discrimination against people with disabilities by federal relief programs. The group was one of the first of its kind to organize sit-ins, picket lines, and demonstrations, and to travel to Washington, D.C., in order to protest and meet with officials of the Roosevelt administration. Paul Strachan, a labor union organizer, founded the American Federation of the Physically Handicapped in 1940. This was the nations first cross-disability, national political organization, and it pushed for an end to job discrimination, lobbying for the passage of legislation which called for a National Employ the Handicapped Week, and other initiatives. Later, in 1952, the President’s Committee on National Employ the Physically Handicapped Week became the President’s Committee on Employment of the Physically Handicapped, a permanent organization reporting to the President and Congress. Following the rise in veterans who were returning injured after WWII, the sport of wheelchair basketball arose as a way for veterans to release much pent up energy. In 1949 the first Annual Wheelchair Basketball Tournament was held in Galesburg, Illinois. Wheelchair basketball, and other sports, became an important part of disability lifestyle and culture over the next several decades. The first National Wheelchair Games in the United States were held at Adelphi College in Garden City, New York in 1957, and the first Paralympic Games were held in Rome, Italy in 1960. Throughout the fifties, and into the sixties the African American Civil Rights Movement was also raging on. There were two primary successes of this movement which relate to the Disabilities Rights Movement directly. The 1954 court decision of Brown vs. The Board of Education, ruled that separate schools for black and white children are inherently unequal and unconstitutional. This ruling served as the inspiration for the Disabilities Rights Movement later on. The second success I’m referring to is the 1964 Civil Rights Act, which outlawed discrimination on the basis of race in public accommodations and employment, as well as in federally assisted programs. This became a model for subsequent disability rights legislation. The 1960’s were years of great change in our country, and this was true of our movement as well. There were several key events which affected a new focus on public access. In 1961, the American National Standards Institute, Inc. (ANSI) published American Standard Specifications for Making Buildings Accessible to, and Usable by, the Physically Handicapped. This landmark document became the basis for all subsequent architectural access codes. Following this, The Architectural Barriers Act was passed in 1968. This act is generally considered to be the first ever federal disability rights legislation, and it mandated that federally constructed buildings and facilities be accessible to people with physical disabilities. The Disabilities Rights Movement enjoyed a series of successes in the 1970’s but these years also came with great struggle for public access. In 1970, Congress passed the Urban Mass Transportation Assistance Act, declaring it a “national policy that elderly and handicapped persons have the same right as other persons to utilize mass transportation facilities and services.” However, this act had little success because it lacked any provision of enforcement. Because of this, many sources of public transportation did not heed the act. In 1972, the Paralyzed Veterans of America, the National Paraplegia Foundation, and Richard Heddinger filed suit to force the Washington Metropolitan Area Transit Authority to incorporate access into their design for a new, multibillion-dollar subway system in Washington, D.C. Their eventual victory became a landmark in the struggle for accessible public mass transit. Still others fought for the right to public transportation throughout the decade. In 1976, The Transbus group, made up of Disabled in Action of Pennsylvania, the American Coalition of Cerebral Palsy Associations, and others, and represented by the Public Interest Law Center of Philadelphia, filed suit (Disabled in Action of Pennsylvania, Inc. v. Coleman) to require that all buses purchased by public transit authorities receiving federal funds meet Transbus specifications, making them wheelchair accessible. Also, in 1978, disability rights activists in Denver staged a sit-in demonstration, blocking several Denver Regional Transit Authority buses, to protest the complete inaccessibility of that city’s mass transit system. This demonstration was the first action in a year long civil disobedience campaign to force the Denver Transit Authority to purchase wheelchair lift-equipped buses. Although the 70’s were certainly a struggle, there were some major successes as well. 1972 saw the founding of The Center for Independent Living (CIL) in Berkeley, California. Generally recognized as the world’s first independent living center, the CIL sparked the worldwide independent living movement. Later, when Edward Robinson became the Director of the California Department of Rehabilitation, in 1975, he moved to establish nine independent living centers across that state, based on the model of the original Center for Independent Living in Berkeley. The success of these centers demonstrated that independent living can be replicated and eventually resulted in the founding of hundreds of independent living centers all over the world. Perhaps the biggest success of the decade was when the Rehabilitation Act of 1973 was passed. For the first time this act confronted discrimination against people with disabilities. Section 504 prohibits programs receiving federal funds from discriminating against “otherwise qualified handicapped” individuals and sparks the formation of “504 workshops” and numerous grassroots organizations. Disability rights activism seized on the act as a powerful tool and made the signing of regulations to implement Section 504 a top priority. Litigation which arose out of Section 504 generated such central disability rights concepts as “reasonable modification,” “reasonable accommodation,” and “undue burden,” which formed the framework for subsequent federal law, especially the Americans with Disabilities Act of 1990. Yet, after all of the successes of the 70’s, the early 1980’s brought about harsh changes for individuals with disabilities. From 1981 to 1983, the newly elected Reagan Administration threatened to amend or revoke regulations implementing Section 504 of the Rehabilitation Act of 1973 and the Education for All Handicapped Children Act of 1975. Disability rights advocates, led by Patrisha Wright at the Disability Rights Education and Defense Fund (DREDF) and Evan Kemp, Jr. at the Disability Rights Center, responded with an intensive lobbying effort and a grassroots campaign that generated more than 40,000 cards and letters. After three years, the Reagan Administration abandoned its attempts to revoke or amend the regulations. However, during these years the Reagan Administration also terminated the Social Security benefits of hundreds of thousands of disabled recipients. Advocates said that these terminations were in an effort to reduce the federal budget and often didn’t reflect any improvement in the condition of those being terminated. A variety of groups sprang up to fight these terminations. As a result of this termination several disabled people, in despair over the loss of benefits, committed suicide. In the final years leading up to the passage of ADA in 1990, several activists called for changes to existing legislation. In Denver (again) in 1983, American Disabled for Accessible Public Transit (ADAPT) was organized at the Atlantis Community Headquarters. For the next seven years ADAPT conducted a civil disobedience campaign against the American Public Transit Association (APTA) and various local public transit authorities to protest the lack of accessible public transportation. Also in 1983, The National Council on the Handicapped issued a call for Congress to “act forthwith to include persons with disabilities in the Civil Rights Act of 1964 and other civil and voting rights legislation and regulations.” In 1986, The Air Carrier Access Act was passed, prohibiting airlines from refusing to serve people simply because they are disabled, and from charging them more for airfare than non-disabled travelers. Also in 1986, The National Council on the Handicapped issued Toward Independence, a report outlining the legal status of Americans with disabilities, documenting the existence of discrimination and citing the need for federal civil rights legislation (what was eventually passed as the Americans with Disabilities Act of 1990). In 1989, the original version of the American with Disabilities Act, was redrafted and reintroduced. 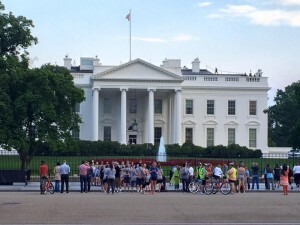 Disability organizations across the country advocated on its behalf with Patrisha Wright as “general” and Marilyn Golden, Liz Savage, Justin Dart Jr., and Elizabeth Boggs as principal coordinators of this effort. 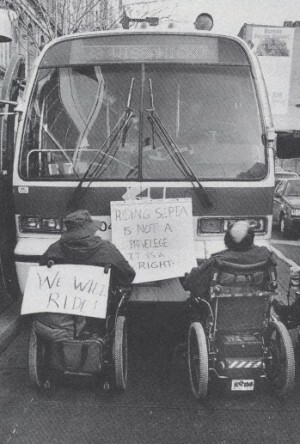 In 1990, the Wheels of Justice campaign in Washington, D.C., organized by ADAPT, brought hundreds of disabled people to the nation’s capital in support of the ADA. 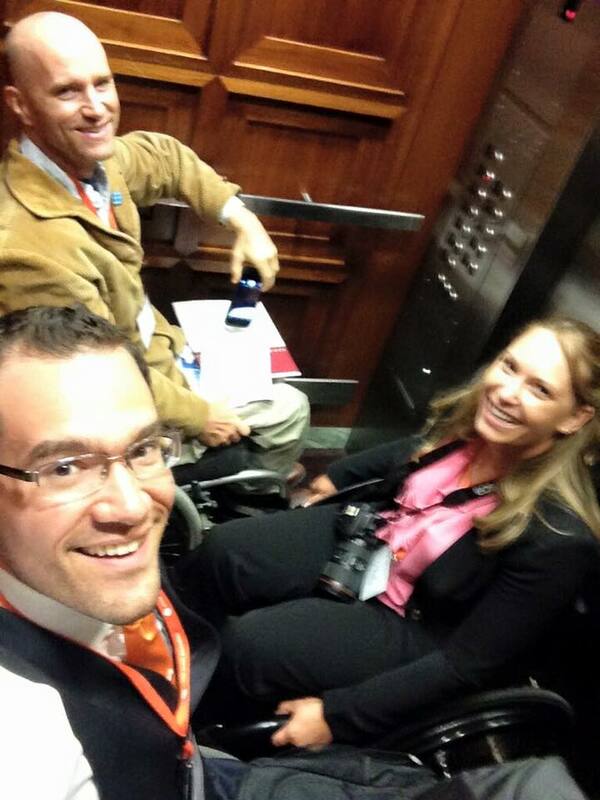 ADAPT activists occupied the Capitol rotunda, and were arrested when they refused to leave. 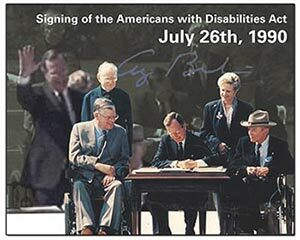 Finally, The Americans with Disabilities Act was signed by President George Bush on July 26th in a ceremony on the White House lawn witnessed by thousands of disability rights activists. The law was and is the most sweeping disability rights legislation in history, for the first time bringing full legal citizenship to Americans with disabilities. It mandates that local, state, and federal governments and programs be accessible, that businesses with more than 15 employees make “reasonable accommodations” for disabled workers, that public accommodations such as restaurants and stores make “reasonable modifications” to ensure access for disabled members of the public. The act also mandates access in public transportation, communication, and in other areas of public life. I hope that this has been an eye opening look at the struggles, set-backs, and successes that have occurred throughout the history of the Disabilities Rights Movement. However groundbreaking ADA is, it is important to remember the history that led up to its signing. Thank you for reading, and please continue to follow us on Facebook and Twitter throughout the month of September to learn about our upcoming events and to see what fun things we are up to. At the end of WWII, many veterans returning from the fronts in Europe were left paralyzed, or confined to wheelchairs as a result of injuries that they sustained. Many where left frustrated, lacking an outlet for pent-up energy. What better way to release this energy than to participate in sports? Many veterans began to play pool, ping-pong, and catch. Soon participation extended to bowling, swimming, volleyball, water-polo, softball, touch football, and basketball. In 1946, the California Chapter of Paralyzed Veterans of America played the first match of wheelchair basketball. Two weeks later the New England Chapter held a match. Before long, wheelchair basketball spread across the nation to VA hospitals in Boston, Chicago, Memphis, Richmond and New York. The sport eventually spread across the border to Canada and across the ocean to England. By 1948 there were six teams in the United States, all members of the PVA and all functioning from VA hospitals. The first wheelchair basketball team outside of a VA hospital was the Kansas City Wheelchair Bulldozers. In April of 1949, a group of University of Illinois students, working under the inspired and tireless efforts of Tim Nugent, Director of Rehabilitation, formed the first National Wheelchair Basketball Tournament. That was the beginning of the sport as we know it today. Earlier wheelchair tournaments, held by the PVA, were only open to paraplegic or spinal cord injured veterans. The newer NWB Tournament was more inclusive and allowed for the participation of civilians with injuries. At first, the organization only included men, but in 1974 women began to be included in tournaments and regular game-play on men’s teams, and later in a women’s division. And the organization continues to push forward. In the fall of 1991, the Congress of USA Basketball voted to admit the National Wheelchair Basketball Association (NWBA) as an active member, following eleven years as an Associate Member. Appointed to the Board of Directors was the NWBA Commissioner, Stan Labanowich. The action represented a significant advance in the integration of the sport into the national governing body. The court is the same size, the basket is at the same height, and the scoring is identical: two points for a regular shot from open play, one point for each successful free throw and three points for a shot from behind the three point line. Players move the ball around the court by passing or dribbling, and are required to throw or bounce the ball after every two pushes of the wheels on their chairs to avoid being penalised for travelling. There are 12 players in each team, with no more than five on court. Games last for 40 minutes, split into four 10-minute quarters. The clock stops for every break in play and teams can call time-outs which last one minute. So there you have it. A quick look at a sport that is fast, fun to play, and entertaining to watch. *Some information for this post was cited from www.nwba.org. Click this link for more information. This is a throwback to the first post we made on our old website. It is fitting that we post it again, as our new website is officially up and running. Enjoy! Today we are beginning a new journey, and we would like to kick start this website by discussing the topic of abilities. Every individual has a unique set of abilities. The word ability refers to being able to do something, whether a natural aptitude or an acquired proficiency which may change as we go through life. Being different on a physical level does not negate this fact. Hensel himself, born with the birth defect Spina bifida, is a prime example of overcoming obstacles. In addition to being a Pushcart Prize Nominee, an Olympic torch carrier, and a significant global advocate for the rights and treatment of individuals with disabilities, he is also a Guinness Book and Ripley’s world record holder. In October 2003, he completed a 6.178 mile long wheelie in his chair. Hensel’s efforts show us that there is no limit to the possibilities that individuals have. It is true that each individual has a different capacity depending on what activity or ability we think about. However, it is our philosophy that with support and nourishment there is no limit to our development as individuals. In the vein of accomplishments there have been many individuals who have overcome great obstacles. Beethoven continued composing music, writing what many consider his best piece (the 9th Symphony), after he developed deafness. Trischa Zorn, who has been blind since birth, is considered to be the most successful Paralympic athlete of all time. Swimming from the 1980 games in Arnhem, to the 1996 games in Atlanta, she collected 55 medals, including 41 gold. Lisa Fittipaldi, a painter and author, learned how to paint after she lost her vision, and then she wrote a book about her experiences. She used painting as a means to find her place in the world after losing her sight. In addition to her inspiring use of color, she is well known for knowing which color she used only by feeling the texture of the paint. Another individual, who became a quadriplegic after being thrown from a horse during an equestrian competition, went on to lobby on behalf of individuals with spinal cord injuries, and for stem cell research. He was Christopher Reeve. In addition, he co-founded the Reeve-Irvine Research Center, and founded the Christopher Reeve Foundation, which is dedicated to finding treatments and cures for paralysis, and also works to improve the quality of life for people living with disabilities. And, famously, Franklin D. Roosevelt did not let Polio keep him from becoming the President of the United States. The stories of these individuals are just a handful of examples to inspire us to strive for higher ground in our lives. Each of us can live a fulfilling life if we work together, supporting and inspiring each other all of the way. And so, in addition to being a source of information for the I AM organization, we hope that this web site will be an epicenter of inspiration and a celebration of abilities. The Scranton Times were nice enough to write this piece in August 2014. 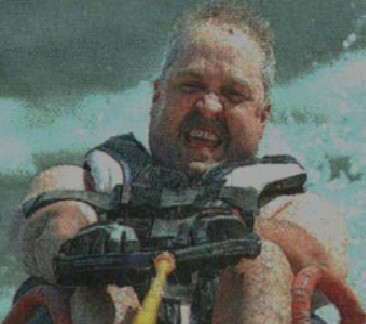 Click below to take a look at our water-skiing venture on Chapman Lake.